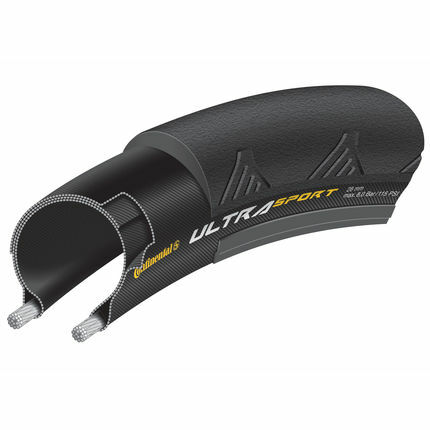 The Continental Ultra Sport II Wire Bead Road Tyre is the last word in performance when it comes to racing. Offering an extremely robust 3/180 TPI design, this is a tire that is serious when it comes to raising the bar in puncture protection. The silica based compound also lends itself to a long tread life and outstanding grip. Really good tyres for the money. Good for training and in all weathers and was very impressed with how they fit on the wheel no levers required, very easy to fit. Great price for the pair. Gone from 23m to 25mm and the difference in comfort is noticable. Nice tires, with a limited budget they suited me well. Early days, but no problems have arisen as of yet. Bargain tyres for winter. Reasonable wet grip & wear rate. Tight bead! Still a great tyre that I'd buy again. Very happy. Good tyre for commuting and longer rides. Quick delivery. Recommended. Great tyres at a great price, road 120 mile coast 2 coast in one day with no problems and in all weathers. Super fast delivery. Highly recommended!